Clarence Plunkett: I told you there was a car behind me. Cop: Well, there wasn't, but there is. Clarence: You mean there isn't, but there was. Cop: I said there wasn't, but there isn't, but there—well, one of us is crazy and it can't be you. 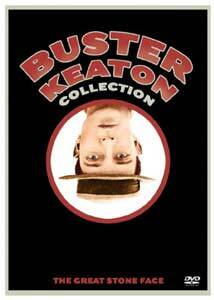 After Buster Keaton's disastrous stint at MGM at the start of the talkie era, chronicled in another DVD set confusingly also titled the Buster Keaton Collection, the comedian suffered a complete breakdown as he lost his livelihood, his wife, his home and his two sons and took refuge in the bottle. He managed to dry himself out, however, and by the end of the 1930s, after starring in a series of short films for the inaptly-named Educational Films, he was ready to take on work for a major studio again. He found a home for ten shorts at Columbia Pictures, working with Three Stooges producer Jules White. The results are mixed, but they're happily presented in good condition in this complete two-disc collection of Keaton's three years at Columbia. The films aren't presented in chronological order; their arrangement here seems rather arbitrary. Many of the pictures team Keaton with brash Elsie Ames and/or pretty Dorothy Appleby, both also vaudeville veterans. Disc 1 opens with the entertaining General Nuisance (1941), which finds Buster as a millionaire determined to impress Dorothy by joining the army. When he learns she's a nurse in the army hospital, Keaton contrives to injure himself, bringing in gags lifted from Laurel & Hardy's County Hospital. In His Ex Marks the Spot (1940), Buster and wife Dorothy decide that they'll get around paying alimony to his ex-wife Elsie by inviting her to live with them. But she brings along her obnoxious boyfriend Radcliff (Matt McHugh), with disastrous results. It's an obnoxiously rowdy short that's hardly suited to Keaton at all, though it does have its moments of tomfoolery. The territory of The General (1927) is revisited in Mooching Through Georgia (1939), as Buster and his brother can't quite decide whether they'll fight for the Union or the Confederacy, and end up fighting for both, changing their uniforms to fit the situations. It gets pretty old pretty fast, but there are some classic routines reprised here. Nothing But Pleasure (1939) features Buster and Dorothy going to Detroit to pick up a car from the factory, but things don't work quite as planned. It's a bit more personal than most of these pictures, since it was based on Keaton himself, who liked to take that method of getting his own cars. In Pardon My Berth Marks (1940), Keaton is a novice reporter sent west to cover a Hollywood scandal, with some predictable and fairly dull business aboard a train. Pest from the West (1939) was the first of Keaton's pictures for Columbia, and it has a bit of a better budget than the others as a result. It's entertaining as Buster attempts to make time with Mexican temptress Conchita (Lorna Gray), ending up going through a series of outlandish costume changes. Disc 2 starts off with one of the better Columbia shorts, She's Oil Mine (1941), a highly-condensed remake of The Passionate Plumber (1932), a film he did near the end of his time at MGM. Buster is a plumber who tries to help out an oil heiress on the run, but ends up getting himself into a duel with her pursuer Clementi (Eddie Laughton). The film climaxes with an excellent duel sequence that is played silently by Keaton, while the others talk. The result makes it clear that this would have been the best way for Keaton to adapt to talkies. So You Won't Squawk (1941) features Keaton being set up to masquerade as gangster Louie the Wolf (McHugh), who believes that he's about to be murdered by a rival gang. It includes some thrill comedy work reminiscent of Harold Lloyd as Buster dangles from a window of a tall building (though in process shots rather than Lloyd's real-life daredevilry). The film ends with a wild police chase, borrowing Keaton's own work from Cops (1922). The Spook Speaks (1940) is easily Keaton's worst film for Columbia and may well be his worst ever. A revamp of Lloyd's Haunted Spooks, it doesn't measure up to that film's already fairly low standards (though it does manage to avoid the racially-insensitive gags of Lloyd's picture). Buster and Elsie are caretakers for magician/spiritualist Mordini (Lynton Brent), and they find his home is full of boobytraps, with the bonus of a roller-skating penguin. An old assistant of Mordini's (Bruce Bennett, who also served as a Tarzan) uses the boobytraps to frighten them as well as a pair of newlyweds (Dorothy Appleby and Don Beddoe) who are staying the night. The set closes with one of the more entertaining shorts on the set, the mysteriously-titled The Taming of the Snood (1940). Jewel thief Dorothy hides some gems in a hatband of a hat in Buster's shop. When he goes to deliver the hat, he has extensive trouble with Dorothy's drunken maid, Elsie. It's quite comical, and features some of the bits from the original vaudeville act that Keaton had done with his parents when a toddler. Part of the problem with these films is that the marriage of Buster Keaton's understated and cerebral humor with Jules White's knockabout slapstick (favoring pratfalls and conks on the head) was doomed from the start. Those who are entertained by the Three Stooges won't mind, but fans of classic Keaton are going to be rather disappointed that his style is so badly submerged to that of White (who not only produced all of the shorts, but also directed eight of them). Elsie Ames' wildly broad style is much better-suited to White, and he makes the most of her talents. Elsie is, nonetheless, quite capable of matching Keaton's physicality, which is still astonishing. In his mid-forties, Keaton is still taking falls and blows as well as he did in his 20s. Some of them, such as in Taming of the Snood, are really impressive. Appleby makes for a good match with Keaton, a fairly talented actress who is able to convey the subtlety that was his forte, while giving the shorts a bit of welcome class. These shorts aren't the equal of Keaton's work in the 1920s, but Keaton even at a low ebb is certainly worth watching. After a few more supporting roles in pictures, Keaton would fade out of sight until his rediscovery in 1949, leading to a renaissance in his career. Image Transfer Review: Other than some speckling (worse at reel heads), these shorts are in pretty good condition. The full frame transfers are reasonably decent, with excellent greyscale and a fair amount of detail. The quality is about comparable to that afforded Columbia's best presentations of the Stooges shorts, though obviously these prints haven't seen the abuse that those have. Audio Transfer Review: The 2.0 mono audio sounds reasonably good for low-budget shorts that haven't been given a lot of attention over the years. There's the expected hiss and limited range, but neither interfere with the enjoyment of the pictures. Extras Review: Each and every one of the shorts has a commentary by one or more authors and historians (plus Tobias, the president of the Buster Keaton Society). With few exceptions, these contain plenty of detail about their filming (including the tidbit that these films were shot in about 3 days each, as opposed to Keaton's preferred rate of a month or more on a two-reel comedy), Keaton's difficult relationship with White, and pointing out the various uncredited character actors populating the Columbia comedies. They're quite good commentaries, with little duplication. Watz is the most interesting of the group, since he makes reference to the onscreen activity most frequently, but all of them are commendable. There's a 24m:50s documentary on Keaton that gives emphasis to his silent classics and naturally the Columbia shorts. It's a reasonable introduction to Keaton, though not the equal of Kevin Brownlow's extensive documentaries on the actor. Finally, an accompanying paperback book includes a facsimile reproduction of the script for She's Oil Mine, taken from Keaton's own copy. It features some fascinating annotations and alterations by the comic, making it a real treasure for any Keaton fan allowing comparison with the finished film. This is a first-rate package of extras for some mostly-forgotten short films. An uneven set, but certainly welcome additions to the DVD works of Buster Keaton. The transfers are quite good and the extras are excellent.